It’s well known that Italians are fiercely proud of their history, food, and culture and a visit to Florence will help you to understand why. Florence is a city blessed with many masterpieces of art, architecture, and literature. You can find Michelangelo’s statue of David, Botticelli’s Birth of Venus, Brunelleschi’s Dome on the Duomo, Florence’s cathedral, and you can visit the home of Dante Aleghieri, author of The Divine Comedy, which is considered the greatest work of literature in the Italian language. You could also visit Florence without seeing any of these things and still understand the pride of the Italians. 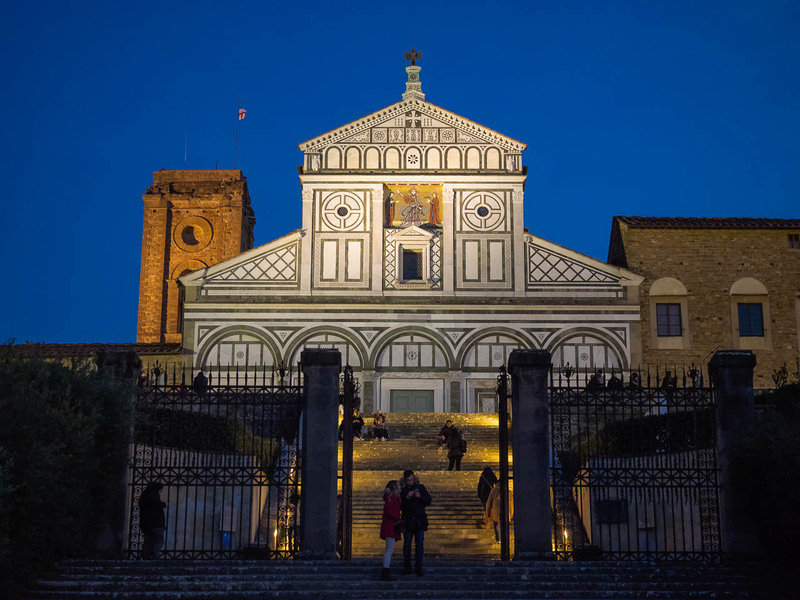 We spent ten days in Florence wandering the medieval streets, eating delicious food, and viewing some of the greatest art of the Renaissance. Leaving Salzburg, Austria, Matt and I continued our train travel, catching the morning train to Florence. We enjoyed taking the trains in Europe, but when using the Eurail Pass, we learned that it is important to be aware that each country has different requirements. 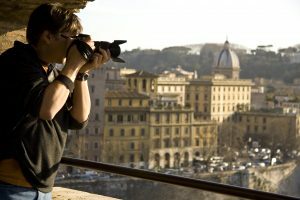 Italy requires reservations for all Eurail Pass holders. Trust us, no matter what we were told by the Austrian ticket office staff, Italy required that we have a reservation. Luckily the train conductor was able to issue two reservations for us right there on the train for about €10 each. 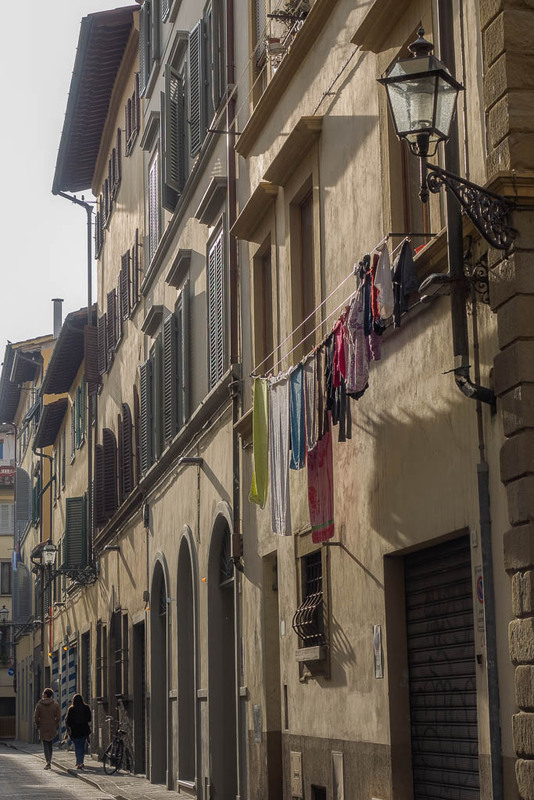 Our apartment that we rented through Airbnb was in the Oltrarno/Santo Spirito neighborhood across the Arno River from the central historical area of Florence. The apartment was about a 20-minute walk from the main train station in Florence though we did have some issue with finding the right building. Addresses in Florence can be confusing to anyone on their first visit. Each house has a number that is either blue or black. Red numbers are for businesses. The numbers run sequentially down the street, but you will see duplicate numbers on signs that are either white numbers with a blue background or white numbers on a black background. Make sure that your Airbnb host tells you the street number and the color. Our host, Anna, met us at the flat and showed us around. She provided coffee, milk, and some snacks in the kitchen. Then Anna graciously went over the map of Florence showing us all of her favorite places, including two fantastic gelaterias nearby. This is one of the great advantages to using Airbnb. The hosts are often very helpful in finding good places to eat and providing information on the tourist sites in town. The apartment was lovely, comfortable, and in a perfect location to explore Florence and still be in a neighborhood where locals live and work. We spent the next several days exploring Florence. It is a beautiful town and like no other in the world. The end of November is a good time to visit because the crowds have calmed a bit and it is possible to move around the city without too many people. The exception to this is the Uffizi museum. Our advice is to make a reservation online and arrive early. The lines can be long and the crowds large. Same with the crowds on the Ponte Vecchio, the most famous bridge in the city, if not all of Italy (with the exception of the Rialto in Venice). By the first week of December the crowds reduce in size and the city is mostly left to the locals. 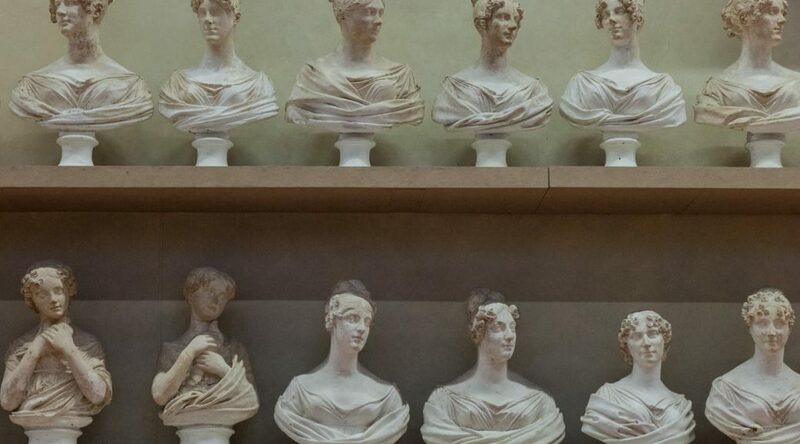 One tip that Anna gave us is that the first Sunday of every month is free museum day in Florence. She advised getting to the museums as soon as they open (and some open as early as 8 am!). Matt and I decided to go Pitti Palace and we arrived around 9 and walked right up to get our free tickets. By ten in the morning, the line to get in was hundreds of people long. Pitti Palace, or Palazzo Pitti, is a royal palace designed by Brunelleschi in the mid-1400s. It currently houses several museums. Matt and I wandered through rooms stuffed full of beautiful paintings, sculptures, furniture, silver, and fashion. We didn’t really know what everything was or who created it, so next time we will arrange for a tour. After a few hours we were overwhelmed. We would suggest touring the palace in stages. It is impossible to see everything in one day. 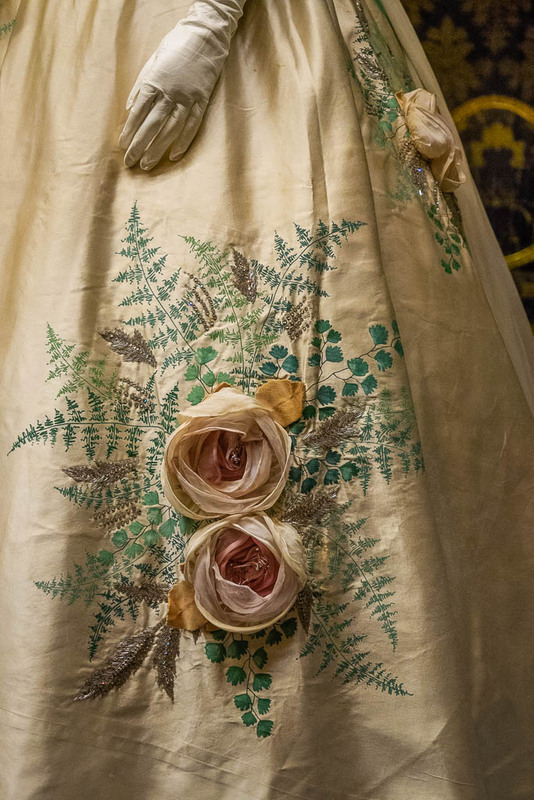 One of the many dresses on display in the Palazzo Pitti’s fashion musuem. 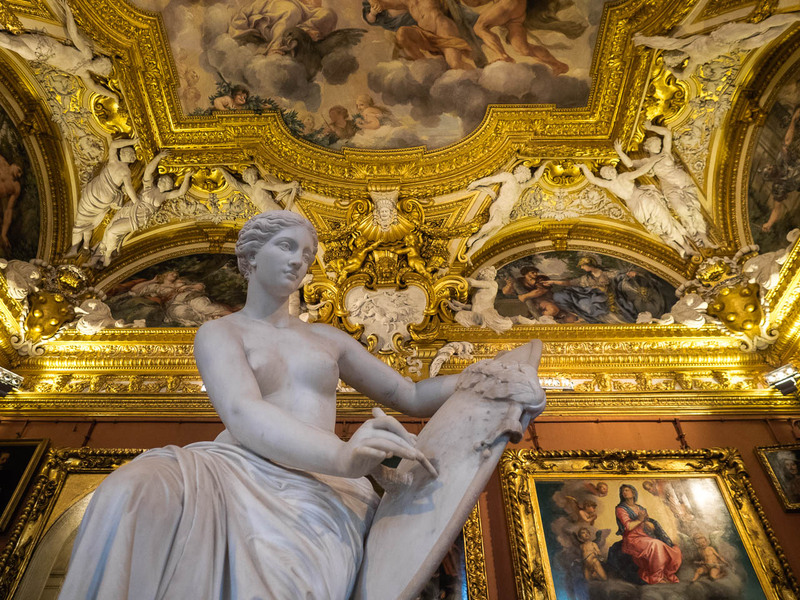 The opulence of Pitti Palace. The weather during our visit was beautiful with clear skies and sunshine. 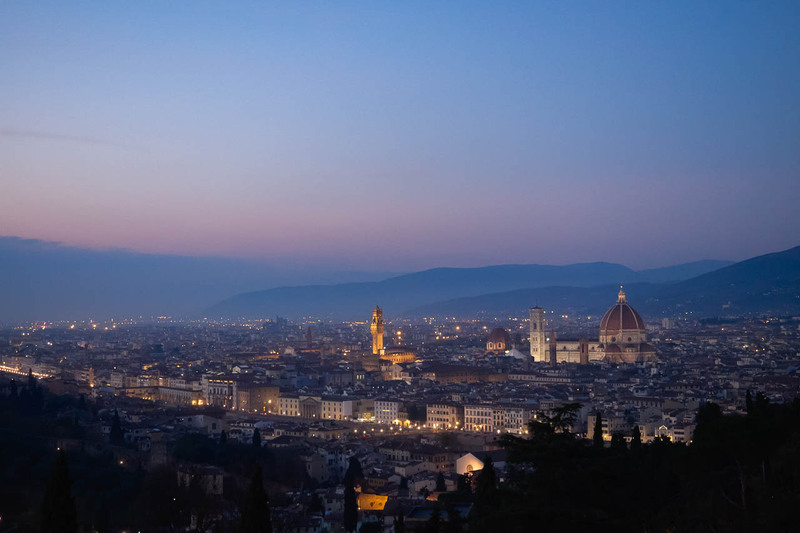 One of the best places to watch the sun set is from the Piazzale Michelangelo located on one of the hills overlooking the Arno and central Florence. Matt and I walked up the hill from our neighborhood. We started in the Piazza Santo Spirito and made our way up the steep narrow streets running away from the river. At the top of hill on Via di S. Leonardo, we discovered Giardino Bardini, a restored villa surrounded by lush olive groves and gardens. 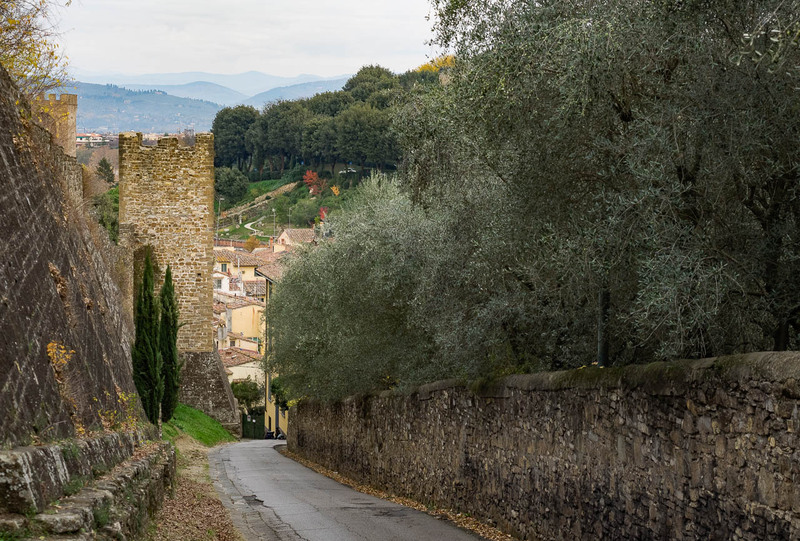 We felt as if we weren’t in a city at all, but were wandering the Tuscan countryside. Walking the back road to Piazzale Michelangelo. There was little traffic, which was good because the road was narrow without sidewalks. Eventually we made our way to Piazzale Michelangelo. It was crowded with tourists, lovers, families, members of the clergy, ice cream carts, and souvenir vendors. Despite the crowd, there was room for everyone to watch as the sun set behind the city. After we had snapped about a hundred photos, I might be exaggerating this, but I swear I edited that many, we continued walking up the hill to the Abbey of San Minato al Monte. On the hill is an 11th century Romanesque church with a view of the valley and gleaming city below. We sat on the steps and watched the lights of the city turn on below. Luckily it was also Christmas time, so the lights included Christmas lights which gave the city an extra sparkle. The lights of Florence as the sun sets. Matt and I were ending our time using our Eurail passes, but we had three more trips to take, so we decided to take the train to the Tuscan town of Lucca. It’s a short, maybe an hour, ride from Florence. The train station is not in the historical center of Lucca, but it’s a short and easy walk of about 20 minutes to the walled town. We walked along the top of the old city wall for a bit, which gave us a great view down into the town. Lucca is well-preserved medieval town within 16th and 17th century walls. It’s most famous resident was Giacomo Puccini, one of Italy’s greatest composers. It was a gorgeous sunny day and the ochre color of the old town walls gave everything a beautiful warm glow. The city was quiet, as the tourist season was definitely over. We wandered empty cobblestone streets occasionally encountering a neighborhood cat or two. 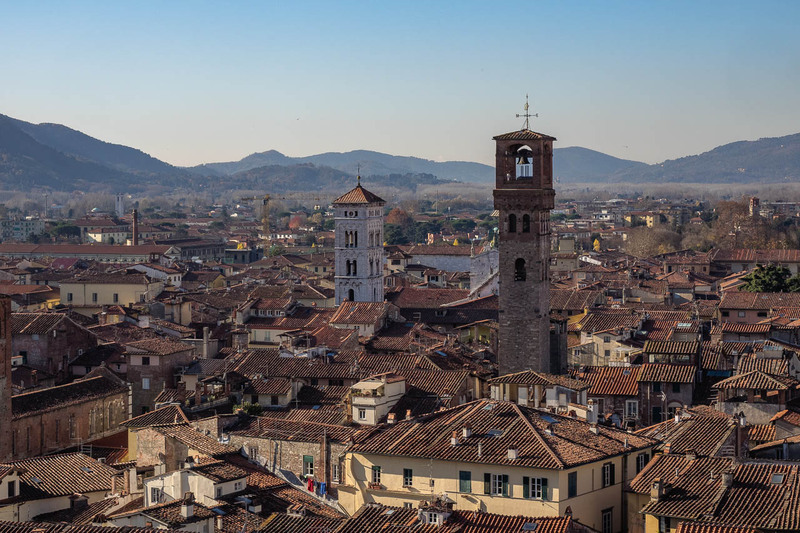 While we didn’t have much of an agenda, other than to explore, I did want to climb to the top of Guinigi Tower (Torre Guinigi) for the great view of the city from atop of the 14th century brick bell tower. The tower is topped with oak trees, planted there in the late 1300s to symbolize rebirth. The view did not disappoint and the 150 foot climb to the top helped us to work up a great appetite. Lucca from the Torre Guinigi. One of greatest gifts that Italy has given the world is its culinary traditions. Italians, more than citizens of most other countries dine on local food that is in season. You will rarely see food imported into Italy, as most Italians really prefer to eat what is produced locally. If you are lucky enough to visit Italy in the winter, you will be treated to incredible products such as wild boar, chestnuts, puntarelle (a delicious bitter green), artichokes, and truffles. Before leaving for Lucca, I did some research on where to eat lunch and Buca di Sant’Antonio came highly recommended. The restaurant is tucked into the corner of an alley meets the corner of a small piazza. There were a few people dining that day, including a birthday party for a woman in her late 70s with the mouth that would make a sailor blush. We were seated near them and given our menus. I scanned the pasta list, as Buca di Sant’Antonio is known for their delicious pastas. They all were reasonably priced, about €11 to €13. I chose the pasta with truffles and a local olive oil and a nice glass of wine. Here is where I will not exaggerate; that plate of pasta was the best that I have ever eaten. Well, one of the two best that I have ever eaten. I wanted to lick the plate and kiss the chef who made it. Unfortunately, my magpie eyes that spotted the pasta with truffles, but had failed to see that it cost twice as much as the other lunch specials, it was a mistake quickly forgotten due to the wonderful food. 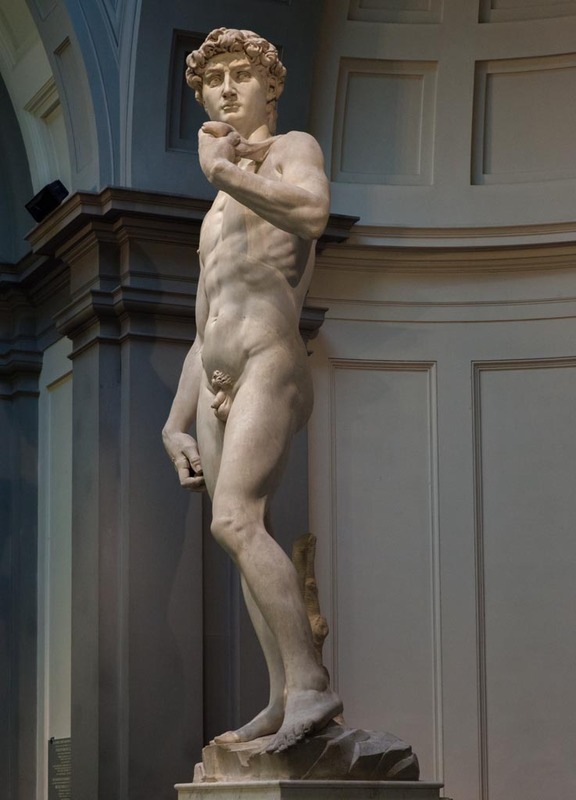 We spent the next few days in Florence seeing more sights including the Uffizi and the Accademia di Belle Arti di Firenze to see the statue of David. 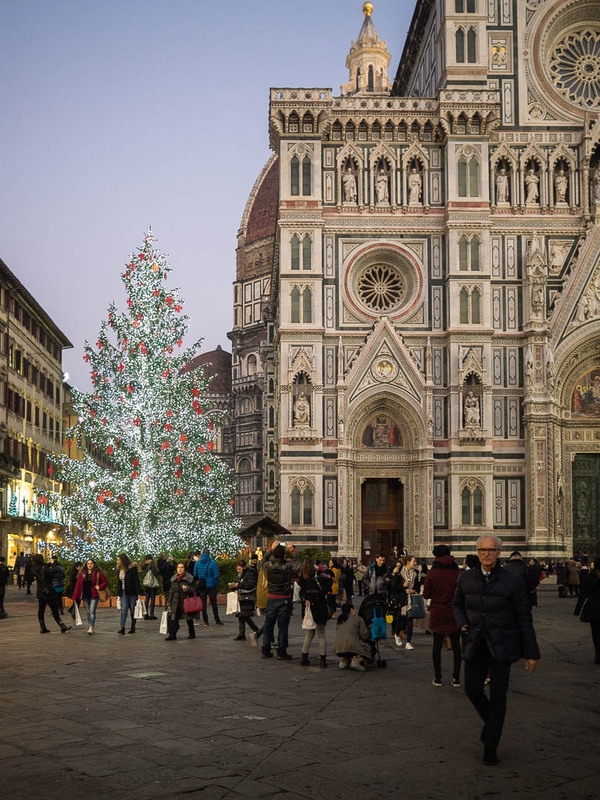 Christmas tree in the Piazza del Duomo. We also had a chance to meet up with some of our wonderful friends and fellow photographers from Foothill College in California. In fact, we spent a lot of time in Florence eating. We ate fantastic pizza while sitting on the steps of the church in Piazza Santo Spirito, eating delicious sandwiches (twice) from I due Fratellini, and lots and lots of gelato. Below is our list of our favorites in Florence that we found, we will have to return to do more research. 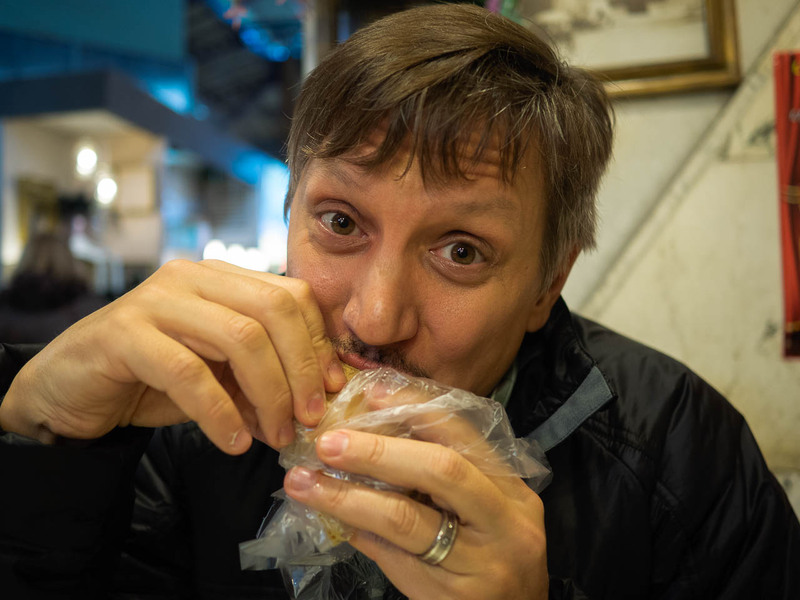 Sandwiches – I due Fratellini – it’s a hole in the wall sandwich stall with a line that is sometimes longer than the line for the Uffizi. 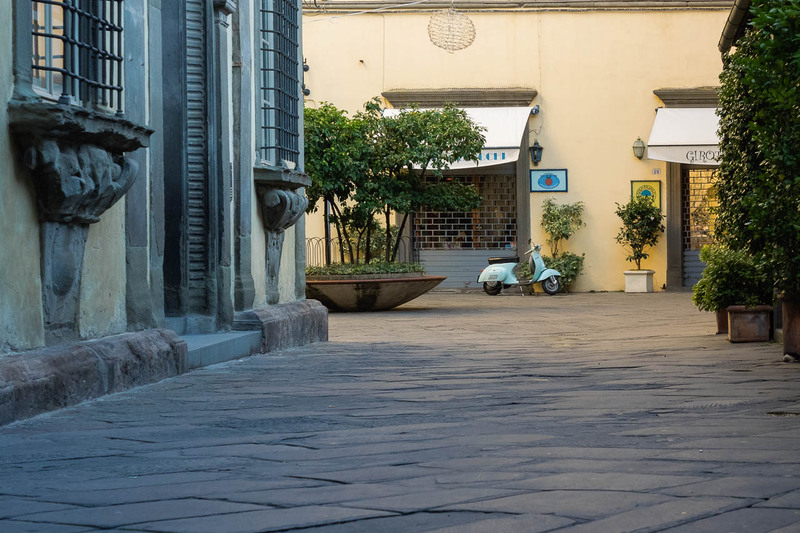 Walk down Via dei Cimaton and when you see the line you know that you are in the right place. It’s at 48r (remember, businesses have red number signs). 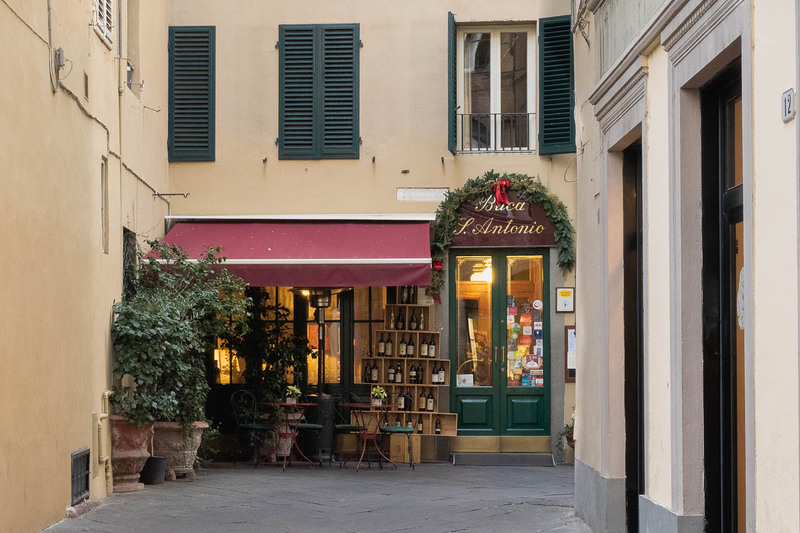 Dinner or lunch – Coquinarius on Via delle Oche, 11r serves delicious and affordable Tuscan food and wine on a quiet street in the city center. Osteria Santo Spirito – Piazza Santo Spirito, 16r – this is in the neighborhood where a lot of university students live and it can get a bit loud and the interior is a bit funky, but they take their food very seriously and it is delicious and affordable. Gelato – now this is tough. I love gelato and do not suffer mediocre gelato well. There are three places we found in Florence, and there are probably more, that make some of the best that I have found. Fiorentini eat gelato all-year around, so the supply in the good shops is fresh and doesn’t sit around to develop ice crystals. Gelateria Artiginale La Strega Noccioli – Via de Bardi 51r – don’t let the long name deter you. 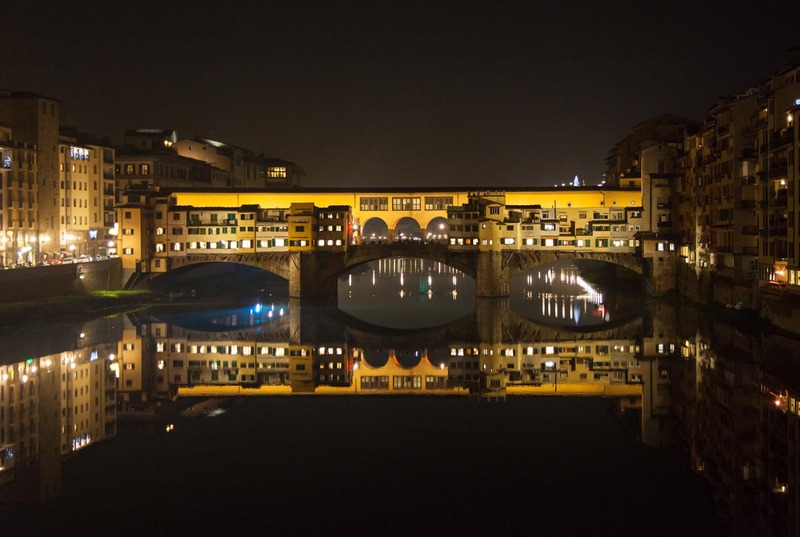 It’s a short walk from the Ponte Vecchio. The flavors are largely seasonal, though traditional flavors are also available. I loved their walnut gelato. It did not have chunks of walnuts in it, instead it was creamy and tasted like the most delicious freshly cracked walnut. Gelato Santa Trinita – Piazza Fresco Baldi 11/12r at the Santa Trinita Bridge – Their coffee and pistachio was delicious. Gelateria La Carraia – Piazza Nazario Sauro 25r at the Carraia Bridge – Every flavor there was perfect and creamy. 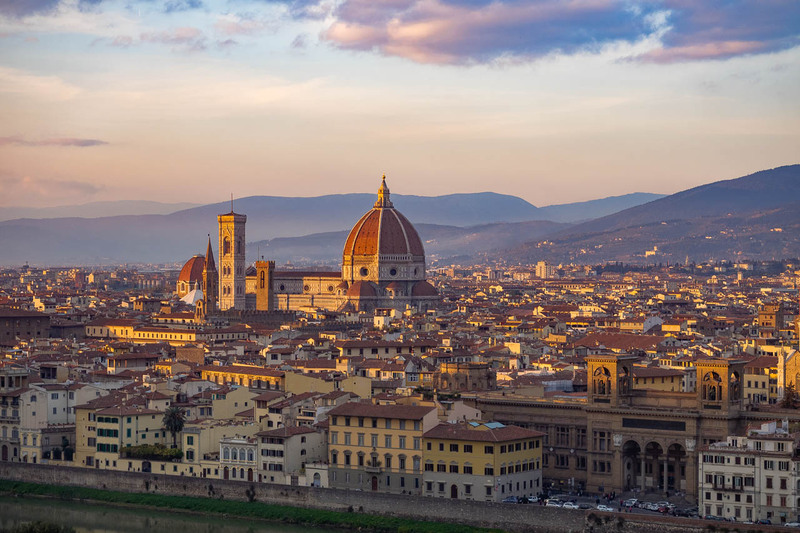 After ten days in Florence, it is apparent why so many students from around the world choose to study in Florence and why each summer the city is swarmed with visitors. We enjoyed our visit and were glad to be there when there were fewer tourists. 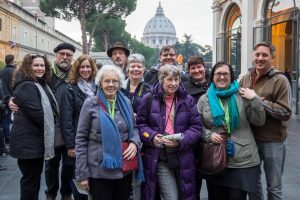 This is another place we will visit again for sure, but our next stop was Rome and I was excited to get there. 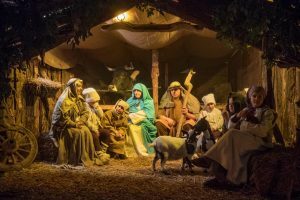 Come Spend Christmas in Rome with Us.